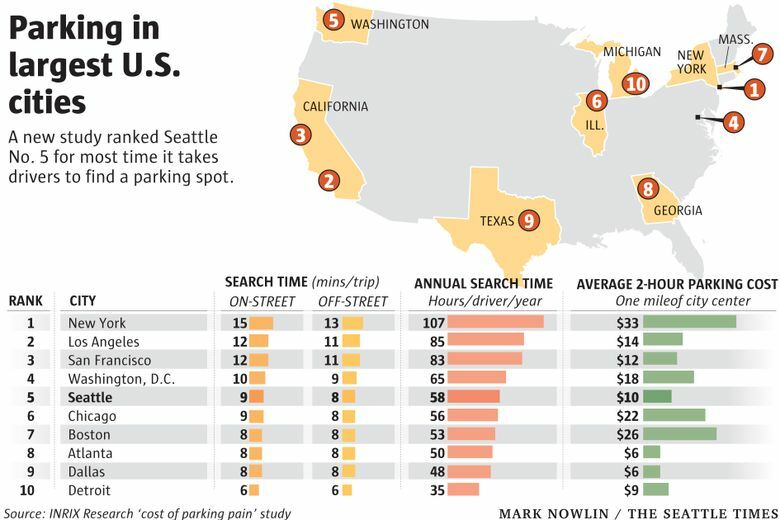 Seattle ranks 5th among big U.S. cities for the amount of time motorists spend searching for open parking spaces, a new report finds. Drivers here spend an average 58 hours each year looking for a parking space. A new nationwide study confirms that the struggle to find a place to park your car in Seattle is real. Seattle ranks No. 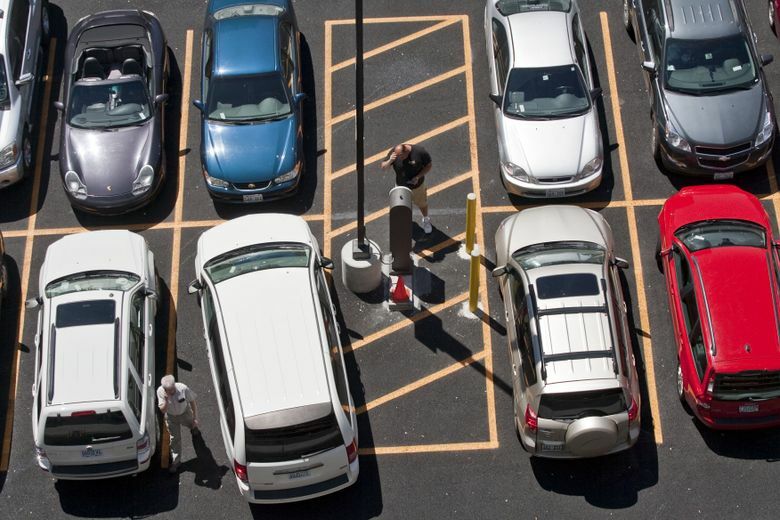 5 among the nation’s largest cities in the INRIX Parking Ranking, released Wednesday, for the amount of time motorists spend searching for parking. Drivers here spend an average 58 hours each year looking for a parking space — more than triple the time for Americans on average, according to the study. The ranking falls just below Washington, D.C. (65 hours) and above Chicago (56 hours). On average, a drive in Seattle includes an 8- or 9-minute search for either off-street or on-street parking, the report found. The extra driving costs an average motorist about $1,200 in “wasted time, fuel and emissions” annually, the findings say. INRIX, a Kirkland-based traffic data and auto-technology company, tapped into its worldwide parking database and surveyed some 18,000 drivers in 30 cities across the U.S., U.K. and Germany. The first-of-its-kind report includes rankings for each country. More than 60 percent of U.S. survey respondents said they have avoided driving somewhere in the past year due to parking problems. In February, INRIX released a report measuring 1,064 cities in 38 countries by a different roadway concern: traffic congestion. Seattle ranked No. 20 worldwide and No. 10 in the U.S., with drivers delayed an average 55 hours last year in peak times. The most clogged city was Los Angeles, averaging 104 hours delay. Tacoma’s traffic ranked 53rd, Portland 30th and Vancouver, B.C., 76th. Beyond measuring drivers’ stress and hours spent trying to park, the study compared parking rates and tickets by cities. Two-hour parking in Seattle costs an average $10, ranking No. 7 among the 10 largest U.S. cities, according to INRIX. New York City measures highest with $33 and Dallas and Atlanta least with $6. Drivers here spend an average of about $20 annually on parking tickets — $8 higher than the national mean, the findings show. According to Seattle Municipal Court records, officers issued 472,126 parking tickets last year. That’s about 37,100 more than the total number of cars in Seattle in 2015. Avoid a ticket by paying the right amount at meters, and don’t park within 5 feet of driveways, 15 feet of fire hydrants, 20 feet of crosswalks, and 30 feet of stop and yield signs. Also, per city rules, drivers must move their cars off a block for a while once the parking time limit there expires. No vehicle can remain parked longer than 72 hours on any given city street. Report parking violations by calling the Seattle Police Department’s nonemergency phone number, 206-625-5011.